Most people are familiar with the traditional use of lemon to relieve sore throat and add citrus flavor to dishes. However, the use of lemon is varied and when you will read this list of the benefits of lemons, you will want to have it in your kitchen. The unpleasant smell from the refrigerator, can be very easily removed using lemon. Soak a sponge in lemon juice and put it in the refrigerator for several hours. Remove from the refrigerator everything you suspected durability and which could cause an unpleasant odor. Lemon contains potassium, which can help in controlling blood pressure. Water with lemon can improve your mood and alleviate symptoms of depression. Lemon will quickly refresh and increase energy levels. If the surface of the table has an unpleasant odor due to the cutting garlic and onion or preparing fish, rub it well with half a lemon. Lemon can attenuate the mucus by coughing, can help you breathe easier and may help people who suffer from asthma. Lemon is a diuretic, which means it stimulates urine production and thus helps in reducing inflammation so it flushes out toxins and bacteria while also relieves the symptoms of arthritis and rheumatism. Daily consumption of lemon or water with lemon can stimulate the production of urinary citrate, chemical compounds that help prevent kidney stones. You do not need to use insecticides to keep away insects from your kitchens. Simply brush with the lemon. First apply it on the handles of doors and windows, then squeeze the lemon juice into every part of the kitchen where you noticed insects. Arrange thin slices of lemon in the kitchen to prevent the arrival of insects. Lemon can reduce the production of free radicals which are responsible for skin aging and skin damage. Water with Lemon does not contain any calories and has excellent properties. You can never know what types of pesticides and dirt can reside on your favorite fruits and vegetables. Pour one tablespoon of lemon juice into a spray bottle and mix with water. Spray fruits and vegetables. Thanks to its anti-bacterial properties of water with lemon can heal throat infection. If gargling salt water is not something that you love, try to gargle water with lemon. If the garbage starts to release an unpleasant odor, you can use lemon to remove it. Save the remnants of lemons and oranges, and put them under bags of garbage. Repeat this every few weeks. Do not throw the pieces of lettuce that are not crunchy. Put a little lemon juice in the water, then add the lettuce and place in refrigerator for an hour. Dry well the lettuce leaves before you use them. Lemon juice can stop bleeding gums and is effective against the toothache. To lighten dark spots on the skin, place lemon juice directly to the affected part of the skin. Leave to stand for 15 minutes, then rinse. This is a safe and effective way to lighten dark spots on the skin. For lighter hair, mix 1/4 of lemon juice and 3/4 of water. Rinse it and let the hair dry. If you want to get results as quickly as possible, this repeat once daily for a period of one week. Mix the juice of 1/2 lemon, 1 cup of warm water and soak your fingers for about 5 minutes. Blackheads can be removed with lemon juice. You can wash your face with lemon and water every day. Your complexion will be improved after a few days. Mix water with a little lemon juice and rinse the mouth. Citrus acid will balance the pH in the mouth and destroy bacteria that cause bad breath. After a few minutes, rinse your mouth with plain water as lemons can damage tooth enamel. Rub the scalp with 2 tablespoons of lemon juice and rinse with water. Then mix 1 tablespoon of lemon juice with 1 cup of water and rinse the hair. Repeat daily until the dandruff disappears. Stains on the marble is sometimes difficult to remove. Cut a lemon in half and rub the marble. No, do not do this often because acid can damage marble. 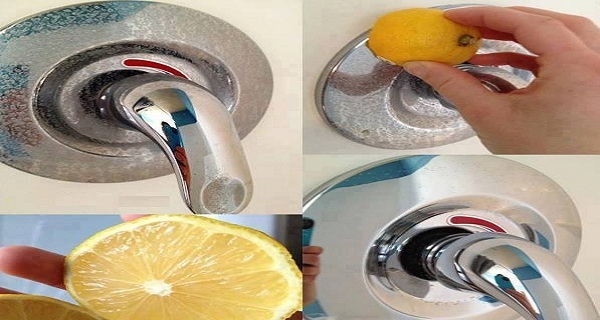 Be sure to rinse the marble with plain water after you’ve rubbed lemon. Lemon juice can remove stains on your fingers. Rub well the fingers with lemon, then rinse with warm water and soap. Repeat until you remove all the stains. For soft and smooth skin on the elbows the best are lemons. Mix baking soda and lemon juice, then rub the mixture on the elbows well. Rinse and lubricate with olive oil. Lemon juice mixed with a few teaspoons of hot tea is great for a hangover or headache. It will be just as effective as painkillers. Fever may be caused by various conditions, a lemon is an effective solution. Lemon juice has powerful antiseptic properties and can improve the work of the digestive system. Take 1 tablespoon of lemon juice every day at the same time. Lemon juice diluted with water is a safe and effective way of maintaining vaginal hygiene. Although it is a powerful antiseptic, lemon will not cause irritation of the vaginal flora. The closet can hold slices of lemon that will repel moths and leave a pleasant and refreshing scent. Digestive disorders are one of the most common complaints, a hot water with lemon is a solution for almost all digestive ailments. Lemon juice will purify the blood, reduce the risk of constipation, eliminate toxins from the body and speed up the work of the digestive system. Stop the bleeding and disinfect small wounds using lemon juice. You can dip a cloth into the lemon juice and firmly adhere to the injured area. You’ve tried various ways to remove warts, but nothing has worked? Next time you put on the wart cotton ball soaked in lemon juice. Repeat the process a few days while the citrus acid does not completely remove the wart. Avoid chemical bleaching of cloths when you can do it with lemon juice. Soak a cloth into lemon juice and baking soda and let stand at least 30 minutes before washing. Tanned jewelry can be cleaned with a mixture of lemon or salt (or soda). Make a paste and leave the jewelry in it for about 5 minutes. Then wash with warm water, rinse and dry. The same mixture can be used to clean the sink. For an even cleaner clothes, add 1 cup of lemon juice in the machine during washing. Lemon will help in removing stains from clothes and your clothes will be a pleasant smell. Rub the lemon on the stain, leave to dry in the sun and repeat until the stain is completely gone. If you heat with wood, your home may have an unpleasant smell of smoke. Flame put lemon peel to prevent odors. To enhance the overall eating habits and encourage detoxification of the body, and alleviate asthma symptoms, take 2 tablespoons of lemon juice before and after meals.